The Resident Bishop of the Liberia Area, Rev. Dr. Samuel J. Quire, Jr. is calling on all United Methodists to unite and move the church forward in making disciples, adding, “it is incumbent upon all of us to unify and implement our respective tasks with duty and commitment.” Delivering his Episcopal Address to the 185th Annual Session of the Liberia Annual Conference meeting in Harper City, Maryland County, Bishop Quire reiterated his pledge to serve the church as a pastoral leader. Bishop Quire indicated that he does not have vested interest in any one individual and as such he will not influence the election of leaders in the various auxiliaries of the church. “I am the bishop of the church and it is my duty to ensure that every United Methodist gets their just service from my leadership,” Bishop Quire stressed. He further indicated that as a unified institution, the United Methodist Church must seek to continue in the mission that will support every member of this Conference and the people of Liberia. Bishop Quire warned that he does not want to lead a divided church, adding, “the episcopal election ended long ago, so let the bickering stop.” He told the gathered United Methodists that building God’s Kingdom will requires the full and active participation all, united in one accord, and with one purpose. In his ten-page Episcopal Address, Bishop Quire reminded United Methodists to support the work of their pastors, stressing, “I do not want for your pastors to beg for bread.” He said he made the appeal at the 184th Annual Session that pastors should not beg for bread, but it remains largely the case for United Methodist pastors. He repeated his call for local churches and districts to drive his agriculture policy which will enhance their financial position to provide better living conditions for their pastors. “I want to see farms throughout Liberia that will be owned by United Methodist Churches,” he emphasized. Bishop Quire thanked the General Board of Global Ministries (GBGM) for substantially supporting the health initiatives of the United Methodist Church in Liberia. With a grant of $1,054,192 United States dollars, the GBGM funded several health initiatives including Imagine No Malaria and the renovation of the Nursing School of the United Methodist University of Liberia. He also thanked the World Diabetes Foundation for its support to the health programs of the United Methodist Church in Liberia. 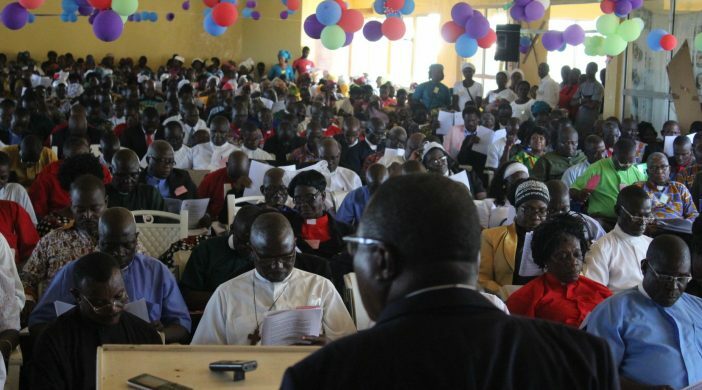 The 185th Annual Session of the Liberia Annual Conference now convening with the Cape Palmas District is Bishop Quire’s 2nd Annual Conference since he took over the episcopal leadership of the United Methodist Church in Liberia. Cape Palmas District is also Bishop Samuel J. Quire’s home district. Here is a link to the text of the Episcopal Address.